Enhance your corporate routine with a half day meeting at The Parlour Inn in Stratford, Ontario. Innovative companies run on tight schedules. There is always more work to be done and sales to be made. Nowadays, employee and stakeholder connections are more digital than personal. An effective meeting does not have to take up too much time. Reconnect with your team members and reaffirm corporate goals with a half day meeting in Stratford, Ontario. Join us for a working breakfast that will reenergize your morning meetings. Cap off your collaborative morning with a gourmet lunch or stroll around scenic Stratford. Alternatively, drive in over the lunch hour for a change of scenery at your strategic afternoon meetings. Take advantage of coffee breaks and an award-winning dinner while collaborating in our boardroom. Morning or afternoon, our planning team will help you to arrange a half-day meeting that keeps your team engaged and energized. Reengage your employees with a much-needed change of pace and scenery. Book an affordable half day meeting with upscale amenities that will make your team feel valued. 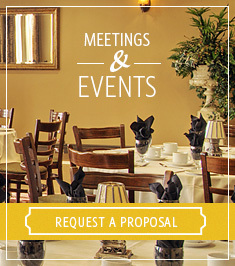 Contact our event planners to set up a strategic meeting in Stratford, Ontario.